Use Vellum’s Title Info pane to provide title, author, and other information about your book. Information provided here will be used by your book’s Title Page, and will be included in the headers of your print edition. Values will also be included in your ebook’s metadata, information about your book that is used by both stores and reading devices. Note: When the Title Info tab is active, the Preview will display your book’s Title Page. Use the top section of the Title Info pane to specify your book’s title, subtitle, and author. Because your book’s title has multiple uses, we recommend specifying it in title case (e.g. “The Invisible Man” instead of “THE INVISIBLE MAN.”). When displayed on the Title Page, the title and author are automatically set in upper case. Contributors listed here will be included both in your ebook’s metadata and on the Title Page. The following values are not shown on your book’s title page, but are included in your ebook’s metadata. 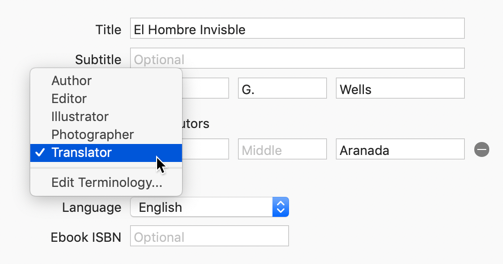 Use this control to specify the language in which your book was written. Vellum will translate certain key terms (e.g. “Chapter”) for French, Italian, German, and Spanish. However, if you choose another language from the popup menu, Vellum will display the Edit Terminology button. 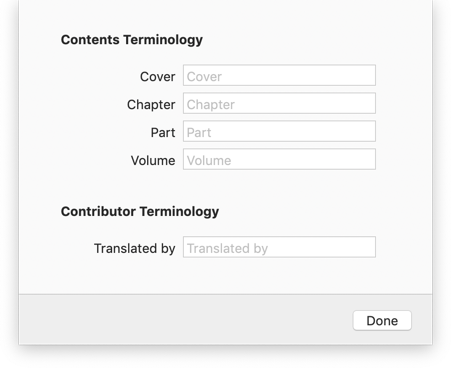 Use this to enter your own translations for element types or for introductions of additional contributors, like translators and illustrators. Terms don’t have to be foreign words. Prefer the word Section to Part? Simply change your Part term rather than giving all of your Part elements new titles. Online stores do not require an ISBN to list an ebook, so this field is optional. If you do acquire an ISBN for your ebook, however, you can list it here and the ISBN will be included in your ebook’s metadata. Note: the ISBN specified here will only be used in your ebook’s metadata. If you’d like for it to be included in the text of your book as well, you can add it to your Copyright.